Asst Director- Passed Graduation and 6 Year WOrk Experience or Passed LLB Degree and 3 Year Work Experience. Asst Director Technical- Passed BE/B.Tech/PG Degree or PG Diploma in Chemistry/ Biotech/ Food Technology/ Food Science/ Dairy Technology/ Agriculture/ Horticulture/Microbiology or Equivalent and 5 Year Work Experience in Similar Field. Technical Officer- Passed BE/B.Tech/PG Degree or PG Diploma in Chemistry/ Biotech/ Food Technology/ Food Science/ Dairy Technology/ Agriculture/ Horticulture/Microbiology or Equivalent. Central Food Safety Officer- Passed Graduation in Food Technology/ Dairy Technology/ Oil Technology/ Biotechnology/ Veterinary Science/ Biochemistry or any Other Equivalent Degree. AO- Passed Graduation and 3 Year Work Experience in Similar Field. Assistant- Passed Graduation in any Discipline. Junior Assistant- Passed Intermediate Exam. Hindi Translator- Passed Masters Degree in Hindi/English and English/Hindi as a Compulsory Subject at Graduation Level. Personal Assistant- Passed Graduation and 80 wpm Shorthand Speed and 40 wpm English Typing Speed and 35 wpm Hindi Typing Speed and Computer Literate. Asst Manager IT- Passed BE/B.Tech/MCA in CS or MCA and 5 Year Experience in Similar Field. IT Assistant- Passed Graduation and PG Diploma in Computer Application/IT. Dy Manager- Passed Degree/Diploma in Library Science/Mass Comm/Journalism/MBA Marketing or Equivalent and 6 Year Work Experience. Assistant Manager- Passed Degree/Diploma in Library Science/Mass Comm/Journalism/MBA Marketing or Equivalent and 2 Year Work Experience. 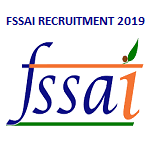 Eligible Candidates can Submit FSSAI Officer, Manager, Assistant 2019 Online Application at the Official Website of FSSAI Latest by 25th April 2019. Applicants First Open FSSAI Official Website. Open Job Opportunities in FSSAI Advertisement Link. Register by Clicking on Start Button.